Goal of Album: To encourage the listener; There is always hope through Christ. Marcus Cole explains on his website: "What I want people to know foremost through my music is that no matter how dark the road in life may now be, it doesn't necessarily mean that's where you'll end up." The musical themes revolve around what Marcus Cole has learned in his own faith walk, which he generously shares with the listener. 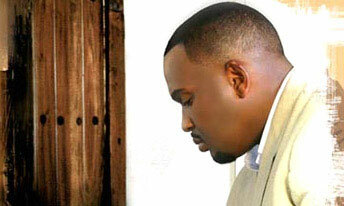 Cole reflects, "The music I sing is about my relation with God. The more I learn about God, the sweeter the music is for me." All we need in life is a relationship with the Lord, which is a powerful source of blessings if we make it a priority. The Lord as a dependable source of comfort, inspiration, strength and love, in all aspects of our lives, even during our most painful losses. JESUS AS OUR LORD AND SAVIOR AND FRIEND FOR ALL TIME. Stressed, and overwhelmed with the busyness, pressures, adventures, challenges, tragedies of life? Need a source of strength and encouragement? 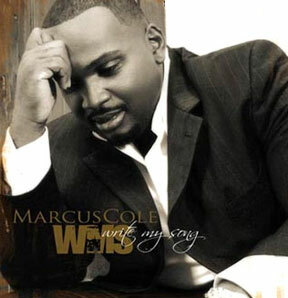 The perfect musical / spiritual antidote to bring salve to your soul and encouragement and comfort to your spirit, is Marcus Cole's Stellar Award nominated CD, WRITE MY SONG, a musically interesting and spiritually motivating collections of songs, which explore the spiritual truth that there is always hope through Christ. There is nothing mundane or boring about this project, either musically or spiritually! For this CD, WRITE MY SONG, offers music and content which is appealing to a wide audience of listeners, paired with themes which explore what a loving faithful Lord we have to depend on during our challenging times. I'm happy to report that Marcus Cole and his talented friends have put together an inspiring collection of songs which offer rich, meaningful lyrical messages paired with an interesting variety of musical compositions, which truly do gladden the heart. Marcus Cole, with the help of his friends & talented musicians, excel in not only in presenting smooth, easy-beat to spirited R & B gospel, with inspiring touches of jazz, swing, soul and funk, but also have no problem offering the listener examples of other genres including contemporary & rock (CELEBRATION), hip Hop dance ( I DON'T KNOW), traditional style hymn (BLESS MY SOUL) and nicely done acoustic with jazz overtones (YOU'RE THERE), uniquely brightened by elements of gospel, expertly blended in, providing refreshingly creative, full-bodied compositions, with a well-rounded sound in its wonderful songs. Each of the songs' compositions uniquely provide the perfect musical support for Cole's expressive vocals, fully supporting the mood of the spiritual messages presented. These compositions offer a dynamic, solid, blended musical support with many colorful counter melodies and subtle ensemble work as well. Though the vocals and lyrical messages are the stars of these songs, which is a characteristic of Gospel music, I was impressed with the horn and sax performances, who have no trouble with the difficult syncopation, or swing rhythms found in some songs, adding a joyous, breezy spirit in whatever cut they perform. The lovely string arrangements using real players add a dynamic poignancy to the melody, never overtaking the vocals or other musical voices. Examples:(BLESS MY SOUL * REMEMBER TO BREATHE). It is refreshing that real live string players were used instead of a synthesizer. The subtle to driving rhythm and melody support by inspiring drum work, a variety of keyboard instruments, and the talented guitar players add yet another layer to the songs. The guitar musicians also shine in some of the songs with subtle to solo riffs ranging from funk to swing to jazz and even rock! The drum and percussion work was equally impressive. Whether simple and subtle (YOU'RE THERE) or driven and prominent (CELEBRATION), both the drum programing and the live contributions add to the drive and zing of the musical sound. The talent of all these musicians flows through this collection of songs, giving their own testimony to their own faith through their performances. Besides offering a diverse variety of well-written, well played musical compositions and inspiring messages, the vocals are equally stunning and effective, as Marcus Cole knows how to use his vocal gifts effectively, in a most musically pleasing manner, expressing a range of feelings, such as: compassion, joy, thanksgiving, and gratitude, giving the listener peace, hope and joy which is in his own heart. Jumping up an octave to hit a high note is made to sound so easy! (THAT'S ALRIGHT * PERSUASION). Besides having fine diction, a richly layered voice, a great set of pipes, all which is supported with great breath control, Marcus Cole offers just the right style and dynamic presentation for each cut on this CD, offering the perfect expression to the spirtually rich lyrical messages, such as (WRITE MY SONG * PERSUASION * REMEMBER TO BREATHE * BEING WITH YOU), which are my lyrical favorites. 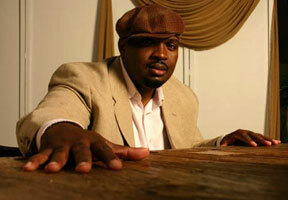 He can master any genre presented, from gospel to jazz in a most enjoyable manner! His performances are professional and his musical ability to do so is showcased front and center, as he shares through his music what he has learned and experienced throughout his own walk with the Lord. For Marcus Cole's vocals surely do share Marcus Cole's faith and personal relationship with the Lord, which shines through, as he expresses from his heart the spiritual messages written so well in all the songs. Let's not forget the guest performers;(Kayla Parker in FINALLY, 2 Five in I DON'T KNOW), and the back up singers and choral ensembles, who also offer dynamic, solid, expressive vocals, always on key, with excellent diction and with focus and concentration. They can sing their choral refrain in HE'S SO GOOD, against a really strong counter melody played by the horns and sax. The mixing of all the tracks and the many fine vocals and back up vocals was well done by the talented Hector Delgado, Anthony AJ Jeffries, and Peter Escovedo. There is a fine balance of the musical voices which truly offers a great musical support for the vocals and the spiritual messages. Let's review why this CD was nominated for a Stellar Award, and would be a great addition to your Christian music collection! Because of the professional, Holy Spirit inspired, well-done lead vocals and back up vocals, well written, meaningful lyrical messages, equally inspiring musically interesting compositions and a dynamite mixing effort, it is no wonder that the resulting total musical package soothes the nerves, while lifting the spirit, and centers the mind on the love and faithfulness of the Lord, with whom having a relationship with should be the most important priority in our lives. I highly recommend WRITE MY SONG for anyone's Christian music collection, whether you are new to R & B gospel with other genres blended in, or a seasoned Gospel music lover! It surely will bless you on several levels, as these songs blessed this reviewer. Spiritual Themes, Musical notes, Evaluations and Possible Scriptural References. All we need in life is a relationship with the Lord. * * * * + + THAT'S ALRIGHT - 2nd Favorite of this reviewer. Theme revolves around the spiritual truth that our most important priority is glorifying the Lord. Enjoy what we have been blessed with, and not fret about secular rewards, or what we don't have in this secular world. Musical Notes: A stellar example of up-beat rhythm & blues Gospel with delightful touches of jazz, funk and soul, held together with an irresistible, tightly played, dotted note R & B rhythm, anchored by well-done drum programming. Musical accompaniment is a tight ensemble of talented musicians, who not only do a fine job of adding spirit to the rhythm and counter melody support, but also add short little funky jazz acoustic elements to the compositions a few measures at a time. Amazingly, Marcus Cole did all the well done vocals and support vocals, with a spirit of joy and faith, which is very encouraging to the listener. * * * * + BEING WITH YOU - Explores the satisfying blessings received from taking time to be with the Lord. Musical Notes: Expressive, laid-back, anthem-like rhythm and blues Gospel prayer hymn. Simple yet effective musical accompaniment easily floats along, with easy-going piano and guitar ensemble which supports the main melody. Guitars shine a little in the fabulous bridge with a bluesy-jazzy counter melody. Melody is carried by the strong lead vocals during the verses. * * * * + + BLESS MY SOUL - Another strong favorite! A beautiful, contemporary prayer hymn which expresses our need for the Lord to bless our soul, help us to grow spiritually and become more like Jesus. Perfect song to end this album, which would fit into any worship service. Musical Notes: A contemporary / traditional piano-based prayer hymn with a glorious, moving melody, great dynamics and equally heart-felt vocals. Musical accompaniment is made up of a solemn, expressive piano and a lovely string ensemble (Viola, Cello, double bass). Composition and vocals build in dynamics and intensity into the inspiring VAMP. 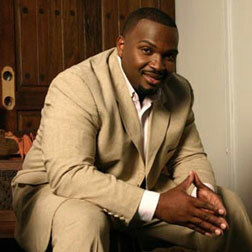 Marcus Cole does a masterful performance, truly putting his faith and conviction into his poignant vocals. The lyrics are his alone as well, as he shares an important part of his walk with the Lord. His strong dynamics and volume demonstrate his stellar breath control. volume and tone are accomplished without getting screechy! The lyrics are his alone as well, as he shares an important part of his walk with the Lord. * * * * + YOU'RE THERE - Contemporary, upbeat acoustic anthem which is a love letter to the Lord, celebrating his faithfulness and love in this believer's life. Musical Notes: After beginning with the sound of thunder and rain, the melodic yet simple acoustic guitar accompaniment and sound block for rhythm make up the upbeat composition which support Marcus' dynamic heart-felt vocals, ending with a melodic VAMP which doesn't disappoint! * * * * + + REMEMBER TO BREATHE - Favorite song of this reviewer. This moving, contemporary ballad is sung to someone who has suffered a terrible loss, overcome with such overwhelming emotional pain that it is hard to breathe. Theme revolves around depending on the Lord to see us through anything, to value every moment we have to live as it is a gift, and to remember to breathe, carry on and have hope in our Lord to make a path out of this dark time. Musical Notes: This haunting, memorable, comforting melody is carried so movingly by a wonderful, delicate, dynamic ensemble of piano, acoustic guitar and a real live string quartet. Though written in a minor key, there are interesting modulations and accidentals, which adds color and beauty to this glorious melody, especially in the bridge, which is my favorite part. This composition is so wonderfully paired with meaningful, heart-felt lyrics and poignant, compassionate vocals, stirring the heart and emotions, especially if the listener has experienced that kind of pain which is hard to bear, threatening to choke the breath out of one's being. Marcus Cole's vocals really bring this song to life in such a beautiful way, sure to comfort the listener who has experienced a terrible loss, or will in the future, as loss in some form is inevitable in life. * * * * + + WRITE MY SONG - Another strong favorite! This contemporary worship and prayer hymn of petition asks the Lord to guide the believers life and use him through his music to bring praise and glory to the Lord. Musical Notes: Contemporary Gospel which would find a home in any contemporary service. Features a strong, memorable melody paired with meaningful lyrics, brought to life with heart-felt lead vocals and lovely harmonies of Marcus Cole and a well done musical accompaniment, pairing the guitar of Errol Cooney with the contributions of Luther "Mano" Hanes on Keyboards, Key Bass and drum programming, creating a very special, moving song, worthy of being the title cut! We learn to wait patiently for the Lord, which develops our faith and brings us closer to Him. * * * * + FINALLY - Trials, adventures, spiritual struggles and bumps in the road are journeys of faith development which sooner or later end, by depending on the Lord and his timing, which is not always easy. A song of thanksgiving for seeing the light of day as the Lord works in our lives as we trust Him. Musical Notes: This dynamic contemporary, piano based Gospel ballad anthem has an infectious peppy melody, supported by upbeat airy, peppy guitar work (Errol Cooney), catchy drums (LaDell Abrams) and percussion (Peter Escoyedo) which work beautifully with the piano, electric piano and bass key voices (Luther "Mano" Hanes). This tight ensemble of sound offers the perfect support for the usual stellar vocals provided by the talented Marcus Cole and guest performer: an up and coming Gospel singer, Kayla Parker, who adds spice and sparkle as a back up and the choral voice, as well as singing the third verse herself, with Marcus backing her up! Lyrical Sample: VERSE 2: It's like pacing the floor all night / to get that little baby to close her eyes / then it happens / Finally!/ Its like after a real bad storm / And then you emerge with no hurt or harm, oooh, finally. Partial VAMP:...... (Finally) Leader: I've heard for so many years / (My soul cries) Weeping may endureth for a night, but joy comes in the morning / It's finally her! It's finally here! (Finally) Thank you Jesus ! (Thank you Jesus) / Letting me see the bright of day / My soul cries / Finally. * * * * + + PERSUASION - Gospel ballad aimed at an impatient person, having a hard time hanging onto their faith that the Lord will see them through their difficult situation. Musical Notes: A delightful urban contemporary Gospel anthem with a laid-back easy R & B beat, complete with poignant lead vocals and modern Gospel harmonies in the chorus, all done by Marcus Cole himself on different tracks. The melody is unusual, but refreshing, perfect for the mood of the song. The highlights for me are the vocals and the meaningful spiritual messages found within this song. The interesting, yet simple musical accompaniment is provided by keyboard and drum programming, guitar and bass, with their wonderfully precise rhythmic, chordal and melodic support. * * * * I DON'T KNOW (GIVE HIM THE PRAISE) - Hip hop dance tune encouraging listeners to show their joy and gratitude to the Lord through a public declaration through action; in a dance, despite their shyness or not feeling like it. Praise Jesus because He is our Lord and Savior. It could also be about a believer who is on the fence, reluctant to openly commit to praising Jesus in front of others. Being a Christian requires action, as Christianity is an active faith. Musical Notes: Peppy hip hop dance tune, complete with a rap by 2 Five. which is easily understood even by the listener who is not rap savvy! Great dance music combined with a spiritual message makes an infectious combination! Marcus Cole of course has no trouble singing in the hip hop style, and carries the song beautifully. * * * * + + THE LORD HAS BEEN GOOD - Strong favorite of this reviewer. Celebrating in thanksgiving and gratitude the Lord Jesus: His mercy and love, and as our Lord and Savior. Musical Notes: A joyous, modern gospel praise anthem, with plenty of zip and zing, blended with influences of syncopated swing, vigorous dotted note rhythms, key modulations, modern harmonies found in contemporary gospel, all propelled by a hot horn section, wurlitzer piano Moog, clav & organ and a pumping, subtle guitar ensemble. Horns shine throughout, especially in the VAMP, offering a stirring counter melody supporting the vocals. Joyous, enthusiastic lead vocals and choral ensemble are a spiritual pick me up, a boost to any listener! * * * * + + CELEBRATE - Another strong favorite of this reviewer! A stirring, energized praise and worship song which is perfect for any contemporary service, as it is an Easter celebration song for all Easter people of faith throughout the year. Spells out the hope we have, the hope we can depend on to be there despite our circumstances. Musical Notes: A full of life, rock and gospel group praise anthem, propelled along with an infectious beat and cooking accompaniment made up of a hot horn section and equally impressive guitar ensemble which both provide the joyous energy, infectious zip and zing which lifts the spirit so well in this song! Drums work is stellar! Lyrics are simple, yet effective, making them perfect for any contemporary group worship. Also love the dynamic, enthusiastic lead vocals and the choral ensemble which bring the lyrical message roaringly to life. It is the kind of song which is impossible not to sing along with! The young and the young at heart would love this song for all of its joy, enthusiasm and invigorating spirit. Definitely a song to listen to when the listener needs encouragement and a lift, as well as a dance around the room!